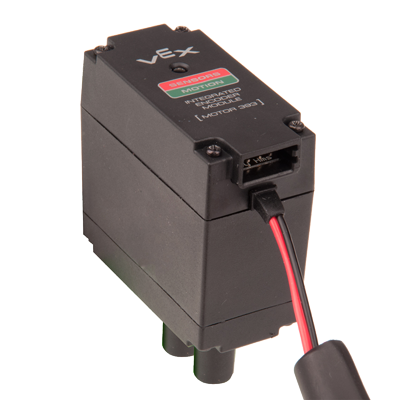 This Integrated Encoder Module replaces the plastic cap on the back of a VEX EDR 2-Wire Motor 393 with a quadrature encoder. Install this product and connect it to your Cortex Microcontroller via I2C to receive direct feedback from the motor. This encoder provides information on how fast the motor is going, how far it has traveled, and what direction it is moving. 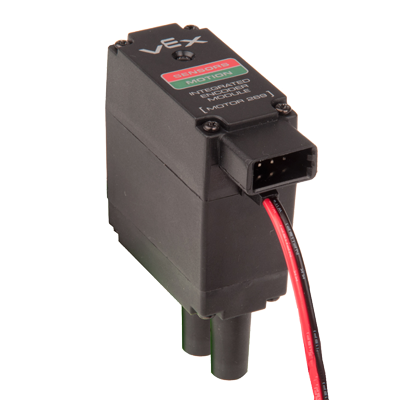 This Integrated Encoder Module replaces the plastic cap on the back of a 2-Wire Motor 269 with a quadrature encoder. Install this product and connect it to a Cortex Microcontroller via I2C to receive direct feedback from the motor. This encoder provides information on how fast the motor is going, how far it has traveled, and what direction it is moving. Do not over-tighten screws when installing the Integrated Motor Encoder. Over-tightening can affect encoder performance. Up to (8) I2C devices can be chained together and connected to (1) I2C port on the Cortex Microcontroller. We've recently discovered that some of our users are experiencing issues with their robot running after it is disabled. This error is due to the way that the VEX Cortex Microcontroller firmware handles a strange reset condition. In very rare situations, the user processor inside the Cortex Microcontroller may encounter a partial reset (caused by a static shock, or intermittent power connection) while the master processor continues to operate normally. In this situation, the Cortex Microcontroller firmware could continue to send the last received command to the motor controllers, causing the motors to continue to run even if the robot has stopped communication with the joystick. This error is rare, and very difficult to reproduce. 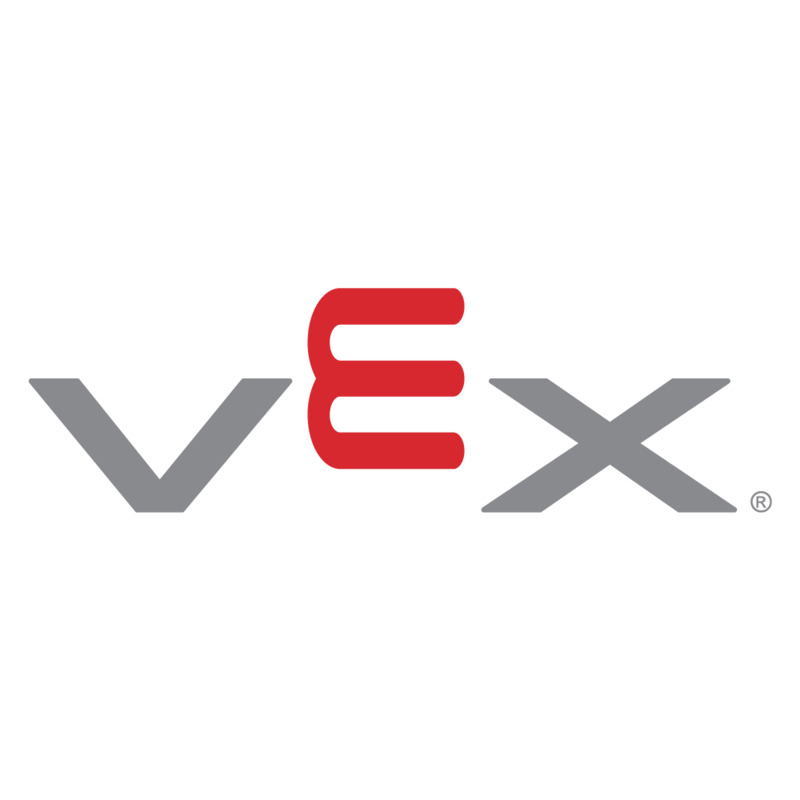 We have identified that robots using the VEX Integrated Motor Encoders may be susceptible to this failure as the result of a static shock to the Cortex Microcontroller's I2C port. Users who experience such a failure should power-cycle their robots, which will reboot the Cortex processors and resume normal operation. This is not something caused by user software programs. The Motor 393 Integrated Encoder Module utilizes a specific internal gear with a printed wheel separated into black and white quadrants. Other than the printed wheel, this gear is identical to the normal 2-Wire Motor 393’s internal gear. Click here to download a page of replacement wheels. In the event of a lost or damaged wheel, this replacement can be printed on standard 8.5"x11" paper, cut out, and glued to any normal 2-Wire Motor 393 internal gear. Thank you to VEX forum user 4149G who suggested this idea - customer feedback is key to improving the VEX experience. The Integrated Encoder Module (IEM) defaults to address 0x60 and is terminated (on power-up). Once the address of the 1st device in the chain has been changed (via REG 0x4D), the terminator must be disabled (via REG 0x4B) in order to communicate to the next device in the chain. When the IEM is in the "Disable Terminator" state, it passes the I2C Clock and Data lines to the next device in the I2C chain. When a device is in the "Enable Terminator" state, it does not pass on the I2C Clock and Data lines. The last device in the chain must be terminated (via REG 0x4C). The suggested address range must be from 0x20 to 0x5E and each device address must be an even number. All devices in the chain can be reset by using a general call address (0x00) followed by a reset command sequence (via REG 0x4E). All device configurations can be erased using the proper command sequence during a general call. Once the device is powered up, the LED will remain yellow until a new address has been received (via REG 0x4D). Byte0 New address (Range from 0x20 – 0x5E) *** Note: if the device is reset it will revert to factor default address.